John Joseph Cerutti was born on April 28th 1960 at Albany, New York. The six foot two, left handed pitcher attended Amherst College. 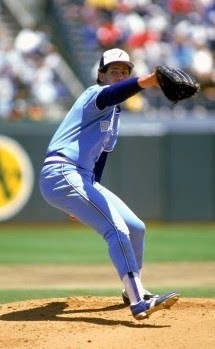 He was a first round draft pick of the Toronto Blue Jays in 1981, the 21st pick overall. He got a cup of coffee in 1985 going 0-2 in four games with a 5.40 ERA. The next season he went 9-4 establishing himself as a solid pitcher. He was mostly a starter but used in a relief role as well. This was the case in his entire seven year career. In 1987 he won a career high 11 games (11-4) with a .733 winning % (second best in the AL). 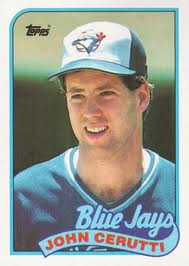 After a 6-7 season in 1988, he rebounded for the First place AL Eastern Champion Jays in 1989. On June 7th, 1989 he made Blue Jays history, recording the teams first win at the newly opened SkyDome, as he beat the Milwaukee Brewers 4-2. On the year he matched his career high, eleven wins but lost eleven games as well. Cerutti posted a 3.07 ERA (9th in the AL) putting up career highs in innings (205) & starts (31). He made two post season appearances, mopping up losses to the Oakland Athletics. In 1991 he signed with the Detroit Tigers going 3-6 with two saves in 38 games. Injuries cut his career short, as he played 1992 & 1995 in the minor leagues before retiring. In a seven year career he was 49-43 with four saves, posting a 3.94 ERA in 229 games (116 starts). Retirement: Cerutti became a broadcaster for the Toronto Blue Jays on CBC & the new Rogers Sportsnet as well. Passing: He was scheduled to work the final game of the Blue Jays 2004 season, but had missed an 11:00 meeting. After he could not be reached, the police were called & broke open his hotel room door. He was found dead, passing from natural causes due to heart arrhythmia. He was 44 years old. Honors: John Cerutti was known and admired for his exemplary character, good will, and sportsmanship. The former Good Guy Award was named after him in Toronto.